The first set of Japanese Autumn Battle Carnivals have just finished up, and the tournament had some pretty interesting results. This won’t have a direct impact on our tournaments immediately, as the format was Black and White to Plasma Gale, and they were also playing with cards from Cold Flare and Freeze Bolt, such as Ether and Bicycle, which weren’t released here, but I think there can be some takeaways from the tournament for our immediate use. Here were the top four finishers at the tournament. (Thanks to RestlessBob for compiling the results for this tournament). As you can see, big basic decks are still running rampant, and Darkrai EX (and to a lesser extend Mewtwo EX) have still staked their spots as some of the best cards in the format. Most of these top decks were running on the Ether and Pokedex engine for Energy acceleration, so that combo is just as potent as a lot of our early testing for the BLW-BC format showed. 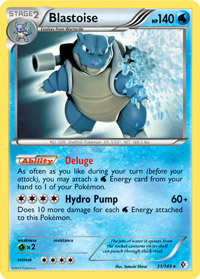 The new cards from Plasma Gale made little effect on the top performing decks for the tournament, with the sole exception being the Black Kyurem EX (it does 200 damage for four Energy) in the Blastoise deck. The deck I want to look at today is the Darkrai/Keldeo deck that took first place in the tournament, as it is a really neat combination. 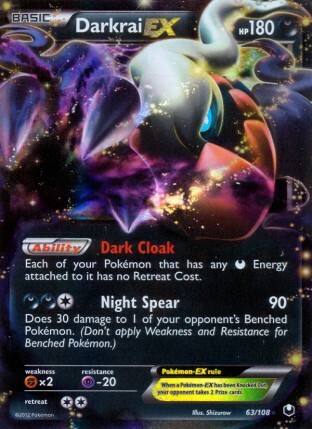 For starters, let’s take a look at why Keldeo EX would be a strong partner in Darkrai decks. 1. Keldeo EX’s Rush In Ability has great synergy with Darkrai EX. If you have a Dark Energy attached to Keldeo EX, you can use its Rush In Ability to promote Keldeo EX active and then retreat to Darkrai EX later in the turn. This can be used to free Darkrai EX from any status lock conditions, such as sleep and paralysis, as well as get a Darkrai back on the bench allowing you to Dark Patch to it. 2. Keldeo EX gives you a counter to Landorus EX. 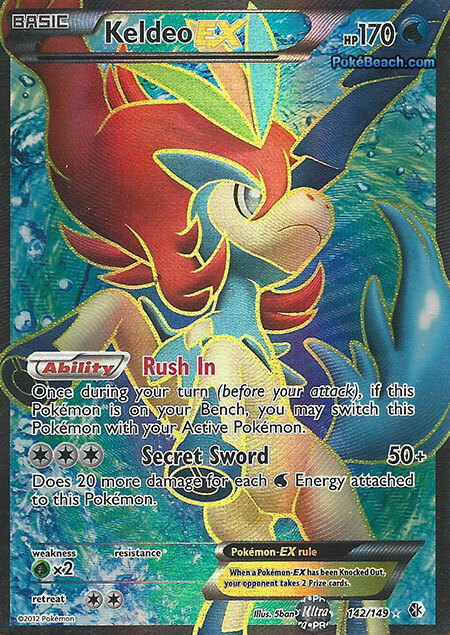 If you have a Keldeo with two Water Energy and a Dark Energy, you can use Secret Sword for 90 damage, which is enough to ohko Landorus EX and Ho-Oh EX because of weakness. 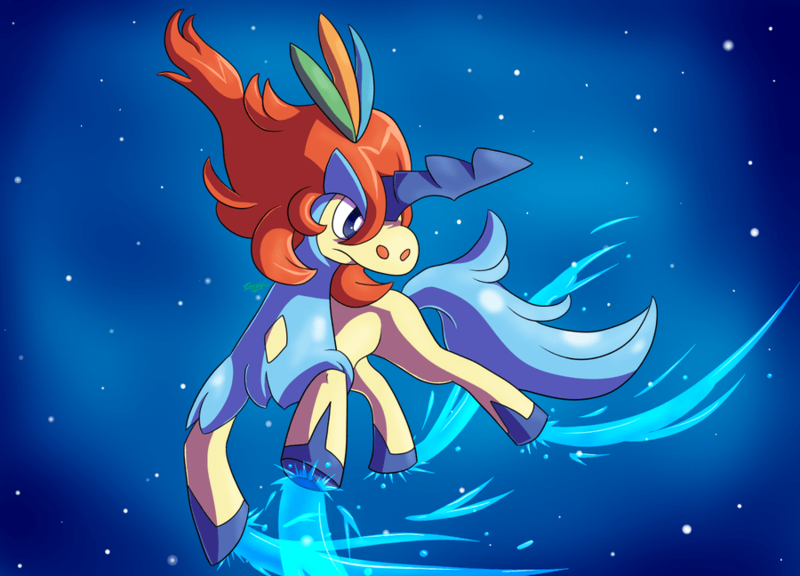 Now obviously, it is going to be much more difficult to get the two Water Energy on Keldeo EX in this format than it would be in a format with Ether, but it is still very much doable, it will just take two turns of Energy attachment to get it done, but that might be quick enough to effectively use Keldeo as a Landorus counter. Some notable features about this list. I chose to play one Mewtwo EX as I don’t want to be getting run over by any giant Mewtwo EX’s, and it is in general very strong in the Blastoise/Keldeo EX matchup. The Revenge Bouffalant is my tech against Sigilyph DRX, at this point, I’m not comfortable playing a deck that doesn’t have an answer to Sigilyph. I also am using Henry Prior’s idea of a tech Ho-Oh EX in this deck, as I think it is really strong when you’re playing at least two different Basic Energy along with Energy Switch. It provides another out for Energy Acceleration in addition to Dark Patch (getting Keldeo EX powered up in one turn is a possibility with Ho-Oh EX), and in a pinch it can work as your Shaymin EX counter if you can attach one more Energy to it from the hand. 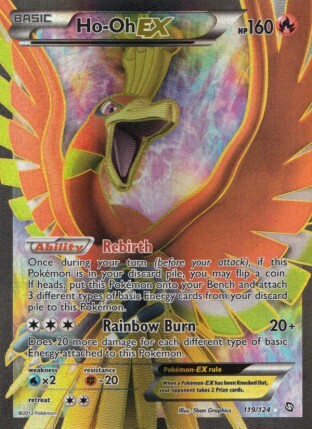 As I play 10 other Basic Pokemon in the deck, I will start Ho-Oh EX in a little less than 1 in every 20 games, which means in most tournaments, I will never start with the card. Even if I do start with it, Keldeo EX’s Rush In Ability will quickly get it out of the Active Spot, allowing it to float freely around your field to no real disadvantage. The one matchup I would hate to start Ho-Oh EX in is the Blastoise/Keldeo EX matchup, but the probability is so low of starting with it as your lone starter that it isn’t worth worrying about. One thing that I have been cutting from my Sableye/Darkrai EX decks has been Random Receiver, which was once considered a staple with Sableye decks, as you could Junk Hunt it as an out for a Supporter. I don’t think this card is needed anymore, for one reason: Computer Search. If I need an out to a Supporter, I can Junk Hunt for Computer Search, and then search out a Supporter that way. This is much more effective as I am not getting a RANDOM Supporter, but I get to choose whether I want a Professor Juniper, Cheren, or N given on the game state (Computer Searching for a Skyla is silly since Computer Search serves the same function). I think playing more Supporters in the deck, while still having the consistency out makes for much stronger decks than the old Random Receiver versions of the decks. Skyla is really strong in this deck, either on turn one for searching out that Computer Search to get you rolling with a Computer Search/Junk Hunt setup, but also in the mid and late games for fishing out key Dark Patch, your Tool Scrapper, and most especially Pokemon Catcher. It feels a lot more comfortable playing only three Pokemon Catcher in a deck when you have a Supporter and Item Card that can put them in hand exactly when you need them. I haven’t gotten a ton of time in testing the deck, as I just heard about the deck yesterday, but I did take the deck out for a leisurely stroll on PlayTCG, and have really liked what I am seeing in the deck. The first game I played with the deck was against a Flygon/Dusknoir/Celebi EX deck. I am not sure exactly how bad this matchup would get without Keldeo EX, but I was able to use it to great effect. For those that don’t know, the aim of this deck is to build up multiple Flygon and spread 10 damage around your field between turns. Once damage has built up, the user can use Dusknoir to consolidate the damage elsewhere to take knockouts. 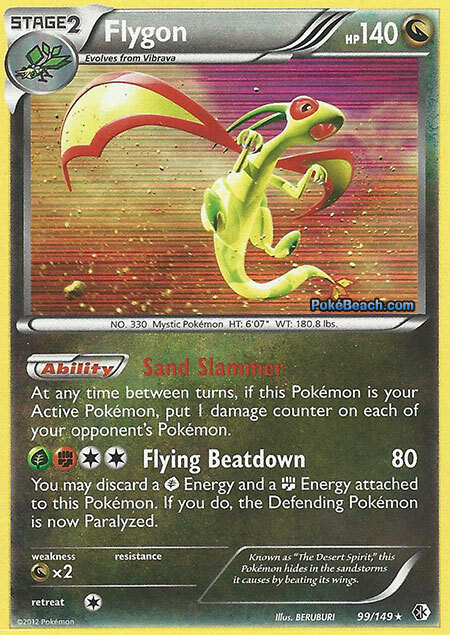 They use Celebi EX’s Time Recal Ability to allow Flygon to use its pre-evolution, Trapinch’s attack Smithereen Smash, which says to flip a coin and if heads, discard an Energy attached to the Defending Pokemon. In combination with Crushing Hammer and Enhanced Hammer, this deck can do a solid job of denying the opponent from attacking while spreading damage all along their field. One thing that kind of blew my mind when playing against this on PlayTCG is that Celebi EX is a viable attacker in this deck. At some point in the game, my opponent used Celebi EX’s Wind Whisk attack for 60 damage on my Sableye, and then retreated to Flygon, which knocked out my Sableye. This was definitely a surprise to me, and something to look out for if your opponent is playing a Celebi EX down…it can attack, and the damage numbers add up decently on the little guys of the format like Sableye. Keldeo EX really shined for me in this matchup. It allowed me to promote something like Sableye or Mewtwo EX without Energy attached into the Active Spot going into my opponent’s turn, protecting my Keldeo and Darkrai from having their Energy removed by Trapinch’s attack, allowing me to setup a Darkrai EX and Keldeo EX for attacking behind that wall, and then just Rush In and retreat to Darkrai EX when it was time to attack. I didn’t find this matchup too tough to navigate, as I just had to limit my bench space to limit Flygon’s damage, and then make the most out of my Pokemon Catcher and snipe from Night Spear to setup knockouts. The second game I played with the deck was against a Blastoise/Keldeo deck. I opened Darkrai EX, used an Ultra Ball for Keldeo EX, attached a Dark Energy to it and used Rush In, leaving my Darkrai EX on the bench and open to be Dark Patch’d to. I was able to get a fast setup and begin taking knockouts on my opponent’s little guys (Wartortle one turn, Squirtle another) while spreading damage on my opponent’s Keldeo EX and Blastoise. I then used a Mewtwo EX to X-Ball his Keldeo EX to 150 damage. He responded to my Mewtwo EX with his own, which was exactly what I wanted, and I setup a second Darkrai EX, N’d my opponent down to four cards, and then used Night Spear for 90 on the Mewtwo EX and 30 on the Keldeo EX for the knockout. On my opponent’s next turn, he whiffed a Super Scoop Up, and from there that was pretty much the game as I had a Skyla and Pokemon Catcher in hand. The Crushing Hammer really came in handy in this matchup, as I was able to set my opponent back a turn on attacking by knocking an Energy off of the Keldeo EX in the early game before he got his Blastoise online. Overall, I am really liking this as a deck concept so far. In some early testing games, it is pretty obvious that the Darkrai and Keldeo have great synergy with each other and the deck as a whole is flowing very smoothly for me. I think the deck can compete well with Blastoise/Keldeo, Eelektrik decks, and Landorus based decks. It has become fairly obvious to me that it isn’t going to be all that difficult to power up a Keldeo EX to attack for 90 damage in this deck, which will surely give a lot of Landorus decks headaches as you easily ohko their main attacker with Keldeo. The main deck I would be worried about with this deck is Hydreigon/Darkrai, as if they get setup, you don’t have any ohko potential against them. To succeed in the Hydreigon/Darkrai matchup, this deck will have to rely on its speed advantage, as well as the hammers for disruption. That may be enough to make the matchup 50/50, but I’m not sure if there is much that can be done to improve the matchup much beyond that. Overall, I am really excited with this deck concept. I don’t think it is anywhere near as strong as it probably is in Japan right now, as the deck is a bit slower without the Ether engine, but even without the Ether engine, it is still a very fast deck that brings together two of the strongest Pokemon in the format for a dangerous combination. I don’t know if youve seen this yet, but the Japanese list didnt actually attack with Keldeo. Instead, the pilot used it as a tech for the Poison Hypnotic Beam trainer, that appears to have dominated the top tables in Japan. This is still a cool deck idea though, and I might play around with it on PTCG if I have the time. I saw that yesterday too when RestlessBob posted the actual lists for the decks. None of the one’s that got reported as playing Ether+Pokedex engine actually did run it, although I am still convinced that it is a strong means of Energy Acceleration, but the Poison Hypnotic Beam/Virbank City Gym strategy looks like it might be stronger than powering up attackers very quickly. I am not sure what to think about these results. Looking at the lists for the decks, it kind of looks like the Darkrai player was able to beat the Landorus deck just with Sableye and using Poison/Hypnotic Beam over and over again, along with Potion. I’m not sure that a format where a Sableye can take down a Landorus EX deck by itself is going to be a super healthy one, but I’m not sure it will be that bad once we get our hands on it and come up with more western strategies to counter that. What do you think of Keldeo-EX as a tech in Darkrai/Hydreigon? Without any water energy, it will 2HKO Landorus-EX and can also be used to Rush In and Dark Patch in the situation where it and Hydreigon are the only things on your bench. The next article that I’ll be writing (which should be up on the website sometime later today) is going to be about tech options for Hydreigon for the Cities format, and Keldeo EX will be discussed in there. For now, I will just say I like the tech and think it’s one of the strongest tech options available, but I’m not quite sure if it will be the play in the deck over other tech otpions yet. I really like this deck. The only thing that concerns me is the 3 Catchers. In my testing, I’ve dropped an enhanced hammer for a fourth catcher. I’d also like to fit in an energy search for an extra out to a water when I need one. I’m thinking an eviolite as a possible drop? Can’t really see anything else except for the bouffalant. I’m on the same page as you however on the topic of sigilyph.